Rate of rise detectors are generally installed in places where smoke detectors would potentially false alarm such as kitchens etc. These detectors do not detect smoke, instead they trigger when the ambient room temperature increases too rapidly indicating a fire may be present. 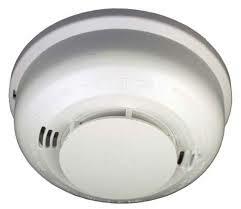 Carbon mon﻿oxid﻿e detectors are designed to detect the presence of Co (carbon monoxide) in an area and trigger an alarm. some common sources of Co include open flames, space heaters, water heaters, blocked chimneys or running a car inside a garage.